What executive actions has Trump taken? Media captionWhat exactly is an executive order, and how significant are they to a president's legacy? One of the first ways a new president is able to exercise political power is through unilateral executive orders. While legislative efforts take time, a swipe of the pen from the White House can often enact broad changes in government policy and practice. President Donald Trump has wasted little time in taking advantage of this privilege. Given his predecessor's reliance on executive orders to circumvent Congress in the later days of his presidency, he has a broad range of areas in which to flex his muscle. Mr Trump signed the order at the Environmental Protection Agency (EPA) undoing a key part of the Obama administration's efforts to tackle global warming. The order reverses the Clean Power Plan, which had required states to regulate power plants, but had been on hold while being challenged in court. Before signing the order, a White House official told the press that Mr Trump does believe in human-caused climate change, but that the order was necessary to ensure American energy independence and jobs. Environmental groups warn that undoing those regulations will have serious consequences at home and abroad. "I think it is a climate destruction plan in place of a climate action plan," the Natural Resources Defense Council's David Doniger told the BBC, adding that they will fight the president in court. Immediate impact: A coalition of 17 states filed a legal challenge against the Trump administration's decision to roll back climate change regulations. The challenge, led by New York state, argued that the administration has a legal obligation to regulate emissions of the gases believed to cause global climate change. Mars Inc, Staples and The Gap are among US corporations who are also challenging Mr Trump's reversal on climate change policy. After an angry weekend in Florida in which he accused former-president Barack Obama of wiretapping his phones at Trump Tower, Mr Trump returned to the White House to sign a revised version of his controversial travel ban. 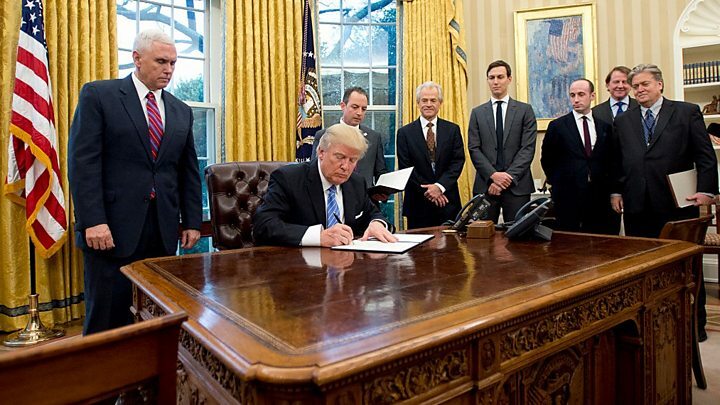 The executive order titled "protecting the nation from foreign terrorist entry into the United States" was signed out of the view of the White House press corps on 6 March. The order's new language is intended to skirt the legal pitfalls that caused his first travel ban to be halted by the court system. Immediate impact: Soon after the order was signed, it was once again blocked by a federal judge, this time in Hawaii. Surrounded by farmers and Republican lawmakers, Mr Trump signed an order on 28 February directing the EPA and the Army Corp of Engineers to reconsider a rule issued by President Obama. The 2015 regulation - known as the Waters of the United States rule - gave authority to the federal government over small waterways, including wetlands, headwaters and small ponds. The rule required Clean Water Act permits for any developer that wished to alter or damage these relatively small water resources, which the president described as "puddles" in his signing remarks. Opponents of Mr Obama's rule, including industry leaders, condemned it as a massive power grab by Washington. Scott Pruitt, Mr Trump's pick to lead the EPA, will now begin the task of rewriting the rule, and a new draft is not expected for several years. Immediate impact: The EPA has been ordered to rewrite, or even repeal the rule, but first it must be reviewed. Water protection laws were passed by Congress long before Mr Obama's rule was announced, so it cannot simply be undone with the stroke of a pen. Instead the EPA must re-evaluate how to interpret the 1972 Clean Water Act. A bill the president signed on 16 February put an end to an Obama-era regulation that aimed at protecting waterways from coal mining waste. Senator Mitch McConnell had called the rule an "attack on coal miners". The US Interior Department, which reportedly spent years drawing up the regulation before it was issued in December, had said it would protect 6,000 miles of streams and 52,000 acres of forests. An attempt to cut down on the burden of small businesses. Described as a "two-out, one-in" approach, the order asked government departments that request a new regulation to specify two other regulations they will drop. The Office of Management and Budget (OMB) will manage the regulations and is expected to be led by the Republican Mick Mulvaney. Some categories of regulation will be exempt from the "two-out, one-in" clause - such as those dealing with the military and national security and "any other category of regulations exempted by the Director". Immediate impact: Wait and see. Probably his most controversial action, so far, taken to keep the country safe from terrorists, the president said. The effect was felt at airports in the US and around the world as people were stopped boarding US-bound flights or held when they landed in the US. Immediate impact: Enacted pretty much straight away. But there are battles ahead. Federal judges brought a halt to deportations, and legal rulings appear to have put an end to the travel ban - much to the president's displeasure. Trump border policy: Who's affected? On Mr Trump's first day as a presidential candidate in June 2015, he made securing the border with Mexico a priority. He pledged repeatedly at rallies to "build the wall" along the southern border, saying it would be "big, beautiful, and powerful". Now he has signed a pair of executive orders designed to fulfil that campaign promise. One order declares that the US will create "a contiguous, physical wall or other similarly secure, contiguous, and impassable physical barrier". The second order pledges to hire 10,000 more immigration officers, and to revoke federal grant money from so-called "sanctuary cities" which refuse to deport undocumented immigrants. It remains to be seen how Mr Trump will pay for the wall, although he has repeatedly insisted that it will be fully paid for by the Mexican government, despite their leaders saying otherwise. Immediate impact: The Department of Homeland Security has a "small" amount of money available (about $100m) to use immediately, but that won't get them very far. Construction of the wall will cost billions of dollars - money that Congress will need to approve. Senator Majority Leader Mitch McConnell has said the Republican-led Congress will need to come up with $12-$15bn more, and the funding fight - and any construction - will come up against issues with harsh terrain, private land owners and opposition from both Democrats and some Republicans. The department will also need additional funds from Congress to hire more immigration officers, but the order will direct the head of the agency to start changing deportation priorities. Cities targeted by the threat to remove federal grants will likely build legal challenges, but without a court injunction, the money can be removed. The Center for Biological Diversity, an environmental group, along with Arizona Democrat Raul Graijalva, have filed a lawsuit against the Trump administration. They argue the Department of Homeland Security is required to draft a new environmental review of the impacts of the wall and other border enforcement activities as it could damage public lands. How exactly will Trump 'build the wall'? On his second full working day, the president signed two orders to advance construction of two controversial pipelines - the Keystone XL and Dakota Access. Mr Trump told reporters the terms of both deals would be renegotiated, and using American steel was a requirement. Keystone, a 1,179-mile (1,897km) pipeline running from Canada to US refineries in the Gulf Coast, was halted by President Barack Obama in 2015 due to concerns over the message it would send about climate change. The second pipeline was halted last year as the Army looked at other routes, amid huge protests by the Standing Rock Sioux Tribe at a North Dakota site. Immediate impact: Mr Trump has granted a permit to TransCanada, the Keystone XL builder, to move forward with the controversial pipeline. As a result, TransCanada will drop an arbitration claim for $15bn in damages it filed under the North American Free Trade Agreement. Mr Trump made no mention of an American steel requirement. Construction will not start until the company obtains a permit from Nebraska's Public Service Commission. The Dakota Access pipeline has since been filled with oil and the company is in the process of preparing to begin moving oil. Keystone XL pipeline: Why is it so disputed? Dakota Pipeline: What's behind the controversy? In one of his first actions as president, Mr Trump issued a multi-paragraph directive to the Department of Health and Human Services and other federal agencies involved in managing the nation's healthcare system. The order states that agencies must "waive, defer, grant exemptions from, or delay" any portions of the Affordable Care Act that creates financial burden on states, individuals or healthcare providers. Although the order technically does not authorise any powers the executive agencies do not already have, it's viewed as a clear signal that the Trump administration will be rolling back Obama-era healthcare regulations wherever possible. Immediate impact: Republicans failed to secure an overhaul of the US healthcare system due to a lack of support for the legislation. That means Mr Trump's executive order is one of the only remaining efforts to undermine Obamacare. What's called the Mexico City policy, first implemented in 1984 under Republican President Ronald Reagan, prevents foreign non-governmental organisations that receive any US cash from "providing counselling or referrals for abortion or advocating for access to abortion services in their country", even if they do so with other funding. The ban, derided as a "global gag rule" by its critics, has been the subject of a political tug-of-war ever since its inception, with every Democratic president rescinding the measure, and every Republican bringing it back. Anti-abortion activists expected Mr Trump to act quickly on this - and he didn't disappoint them. Immediate impact: The policy will come into force as soon as the Secretaries of State and Heath write an implementation plan and apply to both renewals and new grants. The US State Department has notified the Senate Foreign Relations Committee that US funding for United Nations Population Fund (UNFPA) would be withdrawn, arguing that it supports coercive abortion or involuntary sterilisation. The agency has denied this, pointing to examples of its life-saving work in more than 150 countries and territories. This policy will be much broader than the last time the rule was in place - the Guttmacher Institute, Kaiser Family Foundation and Population Action International believe the order, as written, will apply to all global health funding by the US, instead of only reproductive health or family planning. Trump's order on abortion policy: What does it mean? Image caption The TPP pact would have affected 40% of global trade. The Trans-Pacific Partnership, once viewed as the crown jewel of Barack Obama's international trade policy, was a regular punching bag for Mr Trump on the campaign trail (although he at times seemed uncertain about what nations were actually involved). The deal was never approved by Congress so it had yet to go into effect in the US. Therefore the formal "withdrawal" is more akin to a decision on the part of the US to end ongoing international negotiations and let the deal wither and die. Immediate impact: Takes effect immediately. In the meantime, some experts are worried China will seek to replace itself in the deal or add TPP nations to its own free trade negotiations, the Regional Comprehensive Economic Partnership (RCEP), excluding the US. TPP: What is it and why does it matter? What will happen in Donald Trump's first 100 days?